I too wanted to make inventions. Finally I made an invention. It too me long time and a hard work to make this invention. This invention is designed by "Narendra Sisodiya" and He (of-course its me, it is just a style of writing ) claims that his invention is much much better then the invention did by Microsoft and Other Companies. Lets looks 2 inventions by these companies.Then I will tell about my Invention. One of the great invention is done by Microsoft is patent on PageUp and PageDown System. http://www.itwire.com/it-industry-news/strategy/20193-microsoft-granted-page-up-page-down-patent Even they have patent on StartButton, AddressBar and many Other stuff. Inspired from these companies, I am now putting my invention. The new invention is just plug and play type. Just put this fork in noodles plate and apply a little force. Huge number of noodles will stuck inside two fork. you can see the picture attached. 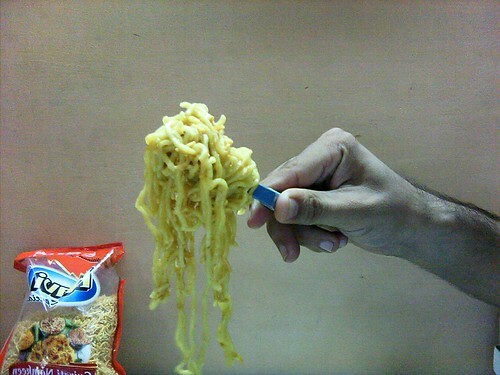 The attached picture shows that you can eat Maggy or other noodle & similar stuff very fast. Well, I am also patenting my invention so that I can get huge money out of it. I have already applied for patent. 2 week before I already got a huge VC funding for such a innovative products ideas. In my research lab, we have hired 3 lawyers who are dealing writing majority of paper stuff. We have already applied to USPTO and other Patent Office across world. Well, I will upload the patent application very soon but here is a small portion. "Title : System for Rotationless™, Low Energy, Fast, Secured Holding method for eatable stuff using Double Fork™ Technology"
The Claimed subject matters provides a system and/or a method that facilitates low energy, fast , secured holding method for eatable (edible) stuff. 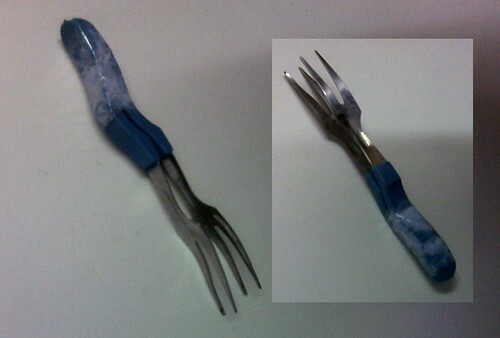 An interface component can leverage a secured way of holding large edible(eatable) stuff inside the invented Fork. Invented Fork provide fast way to eat large stuff. Design is user friendly and low energy based. - 1.01 cm distance between two forks inside the Double Fork™ is the most appropriate separation. - Rotationless™ is unique system by which one can eat noodles without rotation stuff.